Children will be in full action mode as they play with this Game In Mitashi Spark. 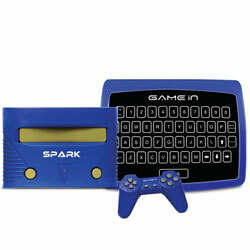 Game with Additional Education Keyboard are also available with this model. Other mentioning characteristics of this model are Built In Adventure and Game Play 16 Bit, Connects to TV, Built In 9999999 IN 1 Games 8 Bit, Over 200 built in Educational and Fun Games, One Wired Joystick, Works on Adapter, Education Game.